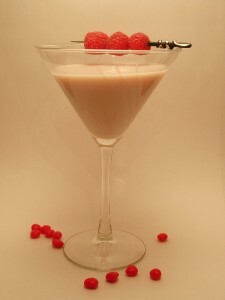 You don’t often thing of adding tequila to a creamy drink, however it works great in this case. The initial taste of the chocolate and raspberry comes surrounded by the full bold taste of the tequila. It’s creamy texture and smoothness is deceptive, this kiss really packs a punch. Place 3-4 ice cubes in cocktail glass in place in the freezer. Combine the tequila, creme de cacao and chambord in a cocktail shaker with 3 ice cubes. Shake for 10 seconds. Add the double cream and stir well. Remove glass from freezer and strain contents of shaker into it. Skewer 3 fresh raspberries and serve.